VideoPi is a simple video player specifically designed for art installations. 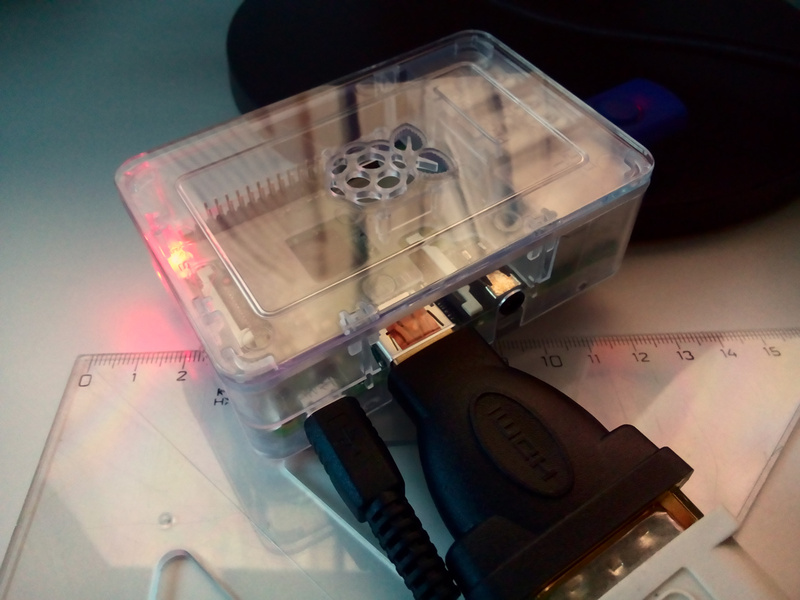 It is a Linux distribution for the Raspberry Pi mini computer. Commonly used media players don’t accept all video formats, require configuration to turn on looping, and need to be manually switched on. Open Etcher and write the downloaded VideoPi image to your SD card. Make sure the HDMI or S-Video cable is connected before you power on VideoPi. When started for the first time, VideoPi will show a message that it’s resizing the root partition and then it will restart automatically. After that a login prompt will appear for a few seconds. Do nothing and wait for the desktop to appear. Once VideoPi finishes the startup, it will show a white desktop with its red logo. You can find a configuration icon in the top left corner. It allows setting screen resolution, sound output (HDMI or 3.5mm jack) etc. To start playing videos, connect a USB stick. VideoPi will play all video files on the USB stick one after another in an alphabetical order. Once it finishes the last file, it will start again with the first file without any break. To enforce particular video order, name your files with numbers or lowercase letters. Non-latin characters (with diacritics, cyrillic etc) as well as special characters (punctuation etc) are discouraged. If all files on the USB stick are JPEG or PNG images, the image slideshow mode will be used. In the slideshow mode, the time between two images is set to 5 seconds. It can only be adjusted by changing the parameter -t 5 in the file /home/pi/bin/video_pi_play to another number, e.g. -t 10 for 10 seconds. If you see the default time between images shorter than 5 seconds, it means the slideshow mode is not on. In this case, you can enforce the slideshow mode by editing /home/pi/bin/video_pi_play to have this content (do not rename the file though). Volume adjustment is not available. Adjust the volume on your speakers. If HDMI is connected, the sound will play from HDMI not the 3.5mm jack. To change that, use the configuration icon mentioned above. The loop (repeat all) function cannot be turned off. Also please let us know if you’re in Berlin or Prague and have a Raspberry Pi 3 Model B+ to lend out. We would like to test VideoPi on it. or we can sell it to you, so it will be yours and yours only forever. In either case, we will help you with the initial setup. To build your own VideoPi image or modify it, see the VideoPi git repository (forked pi-gen). Raspberry Pi 3 Model B+ support: turns on, no video playback (audio only).